How do stove fans work? Stove fans are a fantastic innovation that really do dramatically improve the warmth given out from your stove. We have seen a massive interest in this product in the past year, as wood burners become the ‘in’ product for the home. And why not? They are aesthetically pleasing, easy to operate, low effort to maintain and inexpensive to run too. Having said that, it can take a while for the stove to warm up a room, especially a big room. Using a stove fan will heat the room up in a fraction of the time, and are a really easy way to maximise the warmth you get from your stove. Below, James shows how a stove fan works. Does the stove fan have batteries? No. The stove fan is effectively an engine that uses heat as an energy source to make it run. The heat differential between the base of the unit and the top of the fan drives the motor, which in turn drives the blades around, while the cooling fans at the rear help keep the top of the fan at a much lower temperature, making sure the fan spins maintains constant revolutions. Wood burning stoves have become trendy. The little motor in the fan is a thermoelectric motor – a really simple device whereby two semi-conductors at different temperatures can create a voltage between them. This electricity isn’t huge, but it is just enough to drive the blades of the fan around. Does it work on all stoves? The stove fan will only work on stoves that achieve a certain minimum temperature. This is because the base of the unit needs to get up to temperature before the temperature differential between the top of the device and the bottom is high enough to make the blades turn. Some stoves will require special ‘low temperature’ fans, which are specifically designed to run on stoves that don’t get up to very high temperatures. Generally speaking though, most stoves can benefit from a fan. What is the best position for the fan? The key thing to note when placing your fan is that it needs space behind it. This is because the fan draws cooler air from behind the fan to help power it. If you block the rear of the fan, by setting it up against the wall or the flue, you are going to get an inefficient system. Also try and put it towards the rear of the stove (allowing about 15cm of space behind the fan), so that the fan pushes the warm air out into the room. Can the stove fan get too hot? Yes. If the fan gets too hot it can overheat and damage the motor. To prevent this you can get yourself a stove thermometer to check on the temperature and know when it is getting too hot for your fan. If it gets too hot, you can try moving it to a cooler part of the stove or removing it completely. Different fan models have different maximum temperatures, so make sure you check your model’s specifications. My Aldi fan did the same. I de-soldered the connections to the motor and flipped them round. In the video of James and the stove fan, he’s positioned it on the stove in what I believe is precisely the WRONG ;place. Everywhere I look for advice says to never put it directly in front of the pipe. But that seems to be exactly where James places it. Oh dear. Silly James..
What is the suspected lifetime of the fan? Precisely the power generating plate? My stove top is not horizontal, but sloping. Will it be possible for a stove top fan to work even if the base is not horizontal? It really depends on the degree of the slope! There’s no reason why it being at a slight angle would stop it working – as long as you can find a way to attach it so that it doesn’t slip off. We use magnets to secure the base of the fan to the stove as the angle is quite acute. . It works perfectly. 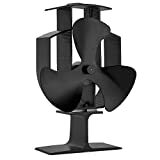 Please let me know the dimensions of the Valiant Fan. My stove is inset with just a 4 inch shelf protruding. therefore I do not have the required15cm of space in front of the flue for the fan. Have you any suggestions how I can solve this problem..
We have a 12 kilowatt log burner so what kind of fan would I need to go for?